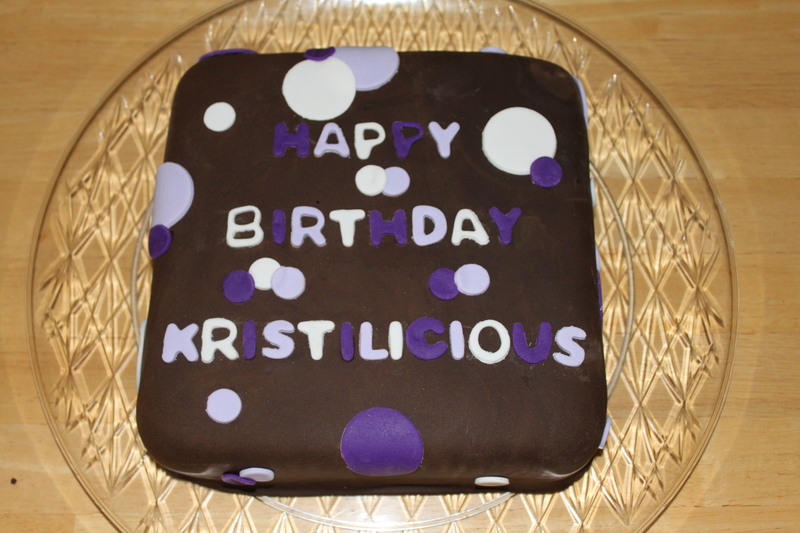 It was my friend Kristi’s birthday last week so Courtney and I put together a surprise birthday cake for her. Courtney started calling Kristi “Kristilicious” several years ago at Girls Camp and Kristi loves the nickname so much (not!) that Cort decided to put it on her cake. The cake is an 8″ Chocolate Sour Cream cake (from the white almond sour cream cake recipe) iced with vanilla buttercream frosting and wrapped with chocolate Pettinice fondant from Funfinity. Cort then took over and decorated it with Duff’s purple buttercream fondant from Michaels and white Pettinice fondant from you know where. We’ve been using corn starch to roll out the fondant (so it doesn’t stick to the mat) but with darker colored fondant it presents a problem when the corn starch gets on it, it is really hard to get off so we need to research and find a different method. Happy Birthday Kristi!